Chris Larson ... "Without my files here I cant say if your colour is exactly per description, but pruinosa has a fair sort of range. I have had a range of sizes from Gautemala but all have been the same colour. Very much consistent with both Ross' & Julie's excellent photos. 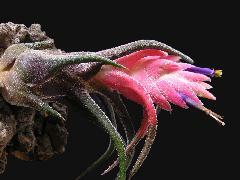 Variations of colour description and other aspects are always expected. Especially when the distribution is wide." Len Colgan ... "You might be interested to know that we collected T. pruinosa growing in the wild way down in southern Ecuador, not far from Zaruma. I admit I was absolutely shocked. However, it is described as having: DISTRIBUTION. 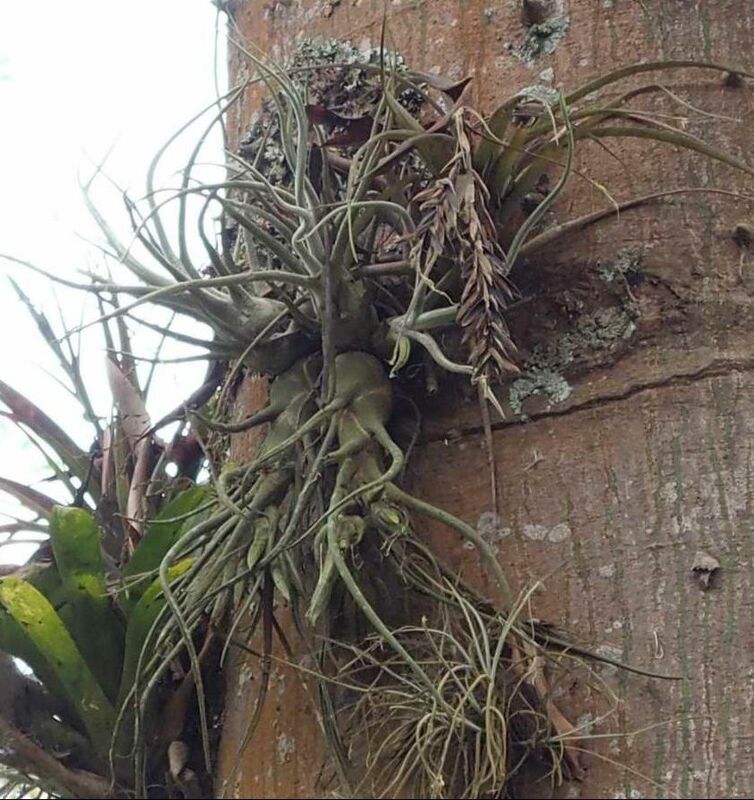 Epiphytic, from near sea level to 1200 m alt, Florida, southern Mexico, and Cuba to Ecuador and Brazil. and does list as the only habitat in Ecuador: ECUADOR. ORO: Zaruma, 1923, Hitchcock 21259 (GH, NY, US). I assume we bungled into that actual isolated habitat. Isn't it amazing that a species we usually imagine coming from Mexico, Central America and the West Indies can also be found in such a remote distant location? Not to overlook Brazil." 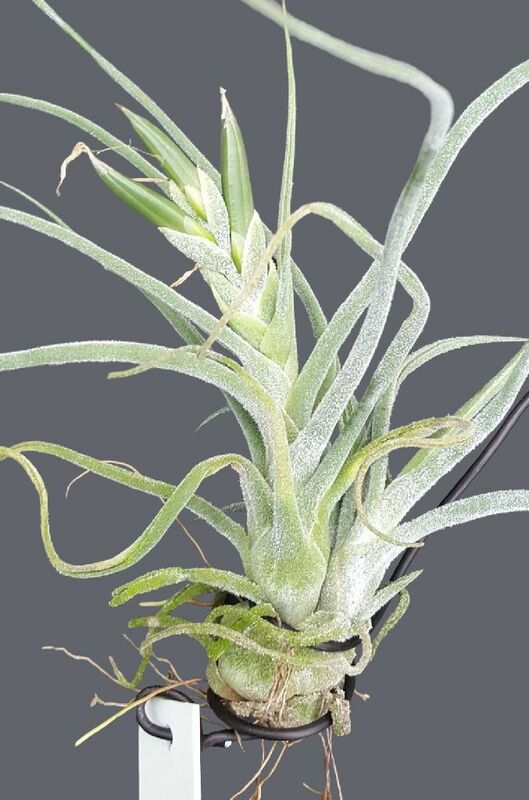 Ross Little ... "Len: Attached is a photo of T. pruinosa I photographed in Ecuador (2015) in that southern area where you mentioned, we only saw the one plant though and we may have been a bit further south. Greg A. will remember the barbed wire fence here when trying to get better photos." Len Colgan ... "Yes, my location was definitely south of Zamura. It makes one wonder how the DNA of this species from southern Ecuador location matches the DNA from Florida habitats." 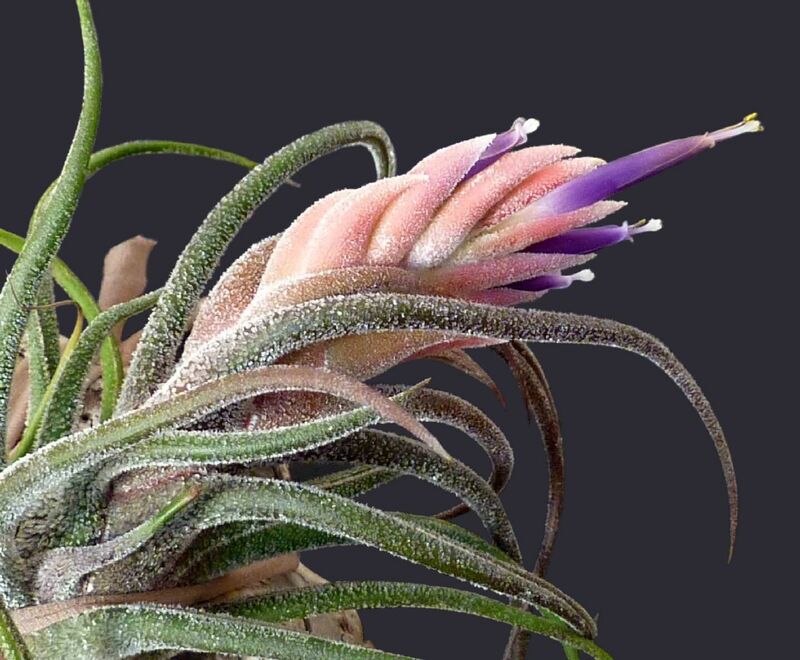 Peter Tristram ... "In my experience the pink bracted pruinosa, from commercial nurseries in the US and plants I collected in Costa Rica, usually self-pollinate and set a swag of viable seed, whereas a larger Colombian form (see pic) doesn’t auto-self and has uncoloured bracts. In 2014 Chris, Michael and I saw some on the west side of the Cauca Valley. I wonder if the Ecuadorean form has coloured bracts? Interesting species! The DNA sure could be interesting Len." Chris Larson 06/17 ... "I have some recollection of a claim that the Colombian form of T. pruinosa does not self. As shown here it does. This is a further comment to my talk in Brisbane. You often get people saying “so & so says this plant doesn’t self. This one does, so it must be the other form”."